There was no church in the Siekierki region during the Second World War, so everybody prayed under a large cross. 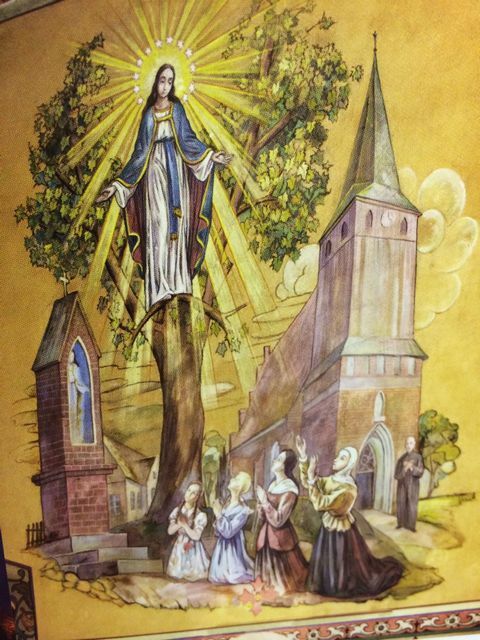 On May 3, 1943, Wladyslawa Papis, age 12, was returning home from praying at the cross when she saw Our Lady appearing above a cherry tree. The girl remembered that she had forgotten her sick uncle in her prayers, so she continued to pray, and Mary watched her and waited. She begged Mary to take her uncle to heaven if he did not recover. Mary turned around three times toward the right and disappeared. 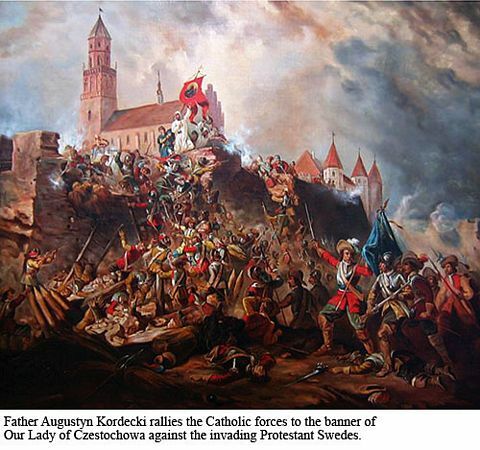 It just so happened that this was the feast day for Our Holy Mother, Queen of Poland. Jesus appeared for the first time on June 28, 1943 at the same cherry tree location and spoke of his great love for people. 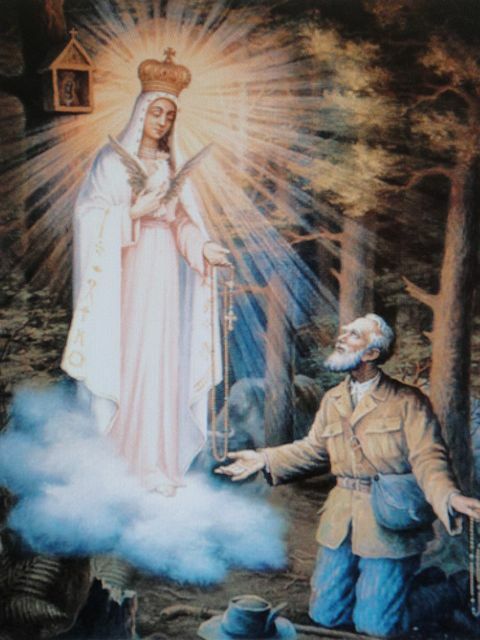 During the apparitions, the Holy Mother dictated the Litany and the Chaplet and a song. Both Our Lady and Jesus left many messages for believers. One time Mary appeared as the Teacher of Young People. The first chapel at the place of the apparitions was built from 1945 through 1946. 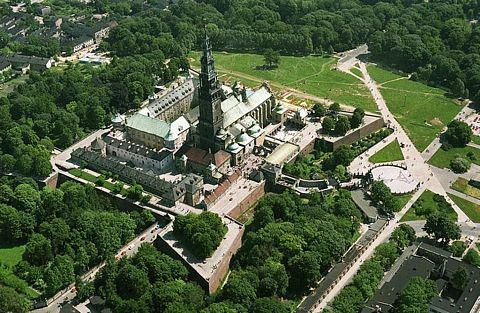 It was opened on May 3, 1946, the anniversary of the first apparition and the Feast of Our Holy Mother, the Queen of Poland. 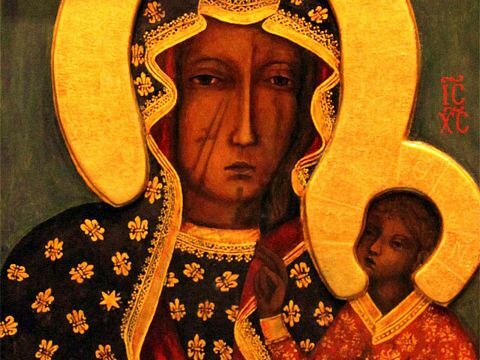 Mary asked everyone to pray during the 24 hours of the first Friday of each month. Twenty-four people chose their hours and prayed at home in reparation for sins of the world. Night vigils would be kept on Saturdays before the 3rd Sunday, analogous to the 3rd of May first apparition. 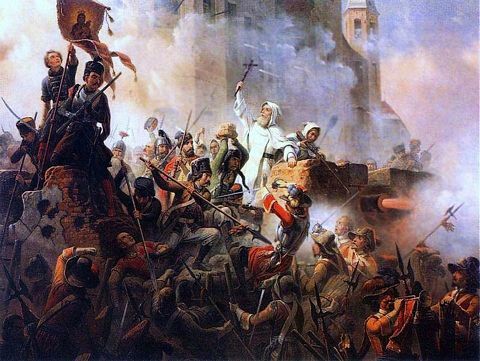 The first apparition appeared to Tomasz Klossowski in 1813 while he was away at war, fighting with the Polish soldiers under Napoleon in Leipzig, Germany. 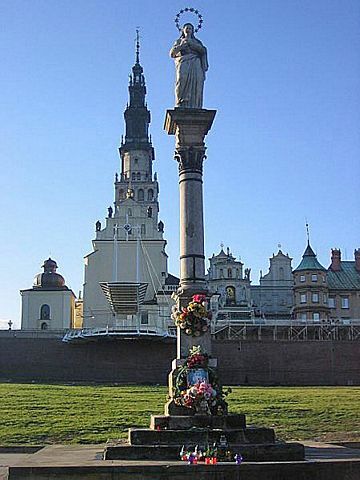 He became gravely injured and feared dying in a foreign country, so he prayed and asked the Holy Virgin to allow him to come back to Poland to die in his own homeland. The Holy Mother appeared to him in the light of the crimson setting sun. 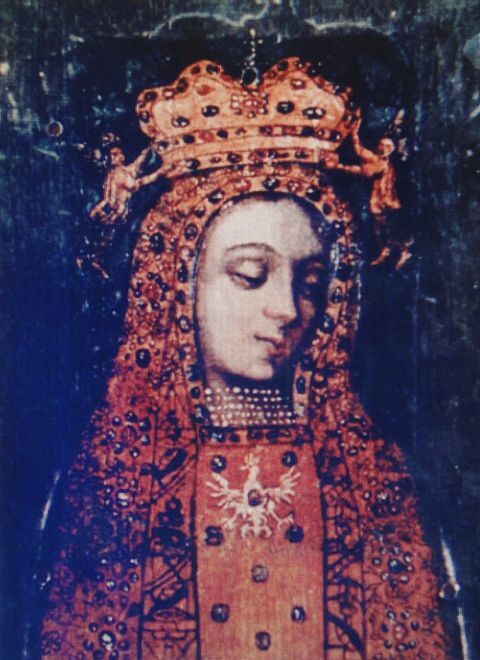 She was wearing the crown, an amaranth dress and a gold mantle. She was hugging a white eagle – the symbol of Poland. She comforted him and informed him that he would be healed and would return safely to Poland. But, she had a request. 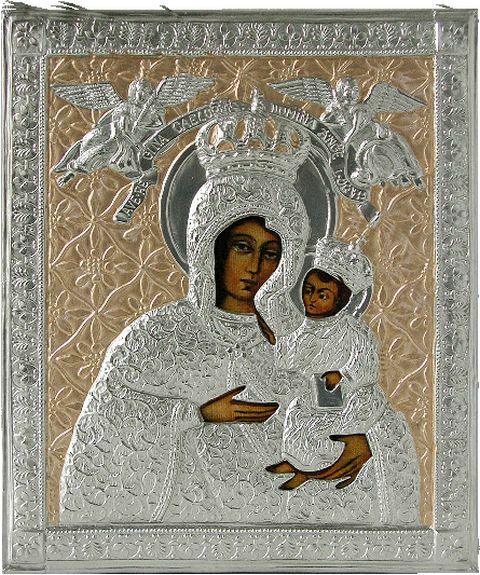 He was to find a picture of Mary, place it in a public area and worship it. 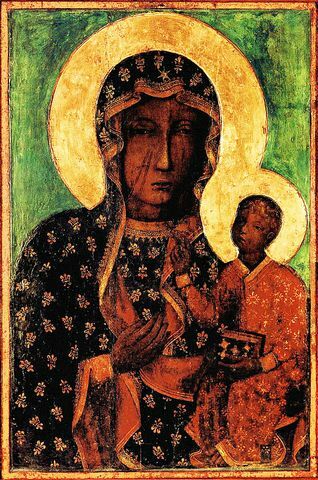 When he returned to Poland, he searched for a picture of Mary – and finally found one in 1836 on the way back from a pilgrimage to Czestochowa. He took the picture and hung it on an old pine tree in the Grablin forest near his house. Soon after, he died. 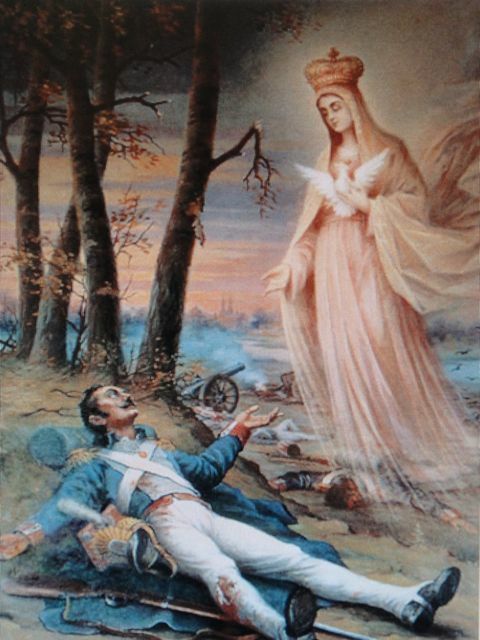 Tomasz Klossowski is saved by the Virgin Mary in wartime of 1813. 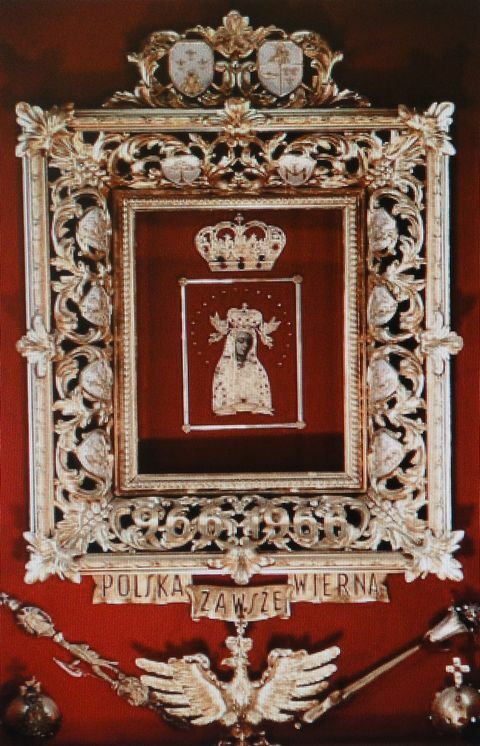 The tiny little picture of Our Lady of Lichen, framed and hung. The Holy Virgin predicted the formation of the sanctuary and the monastery in Lichen from which her glory would flow. 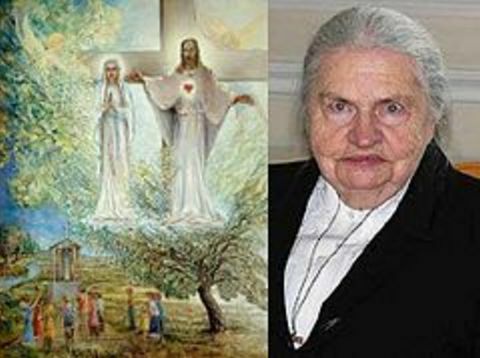 The shepherd Mikolaj started to expound Our Lady’s message, but he was persecuted and imprisoned by Russian authorities. The miraculous healings occurred in front of Our Lady of Lichen. same year, the picture was placed in the parish church in Lichen. 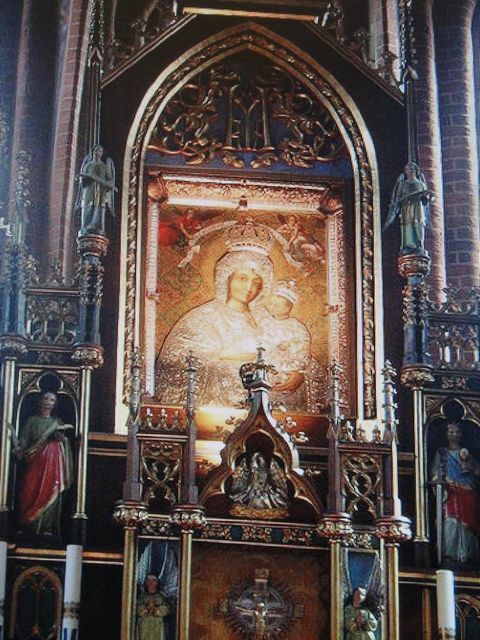 People remembered the Virgin’s prophecy and thronged to her portrait to kneel and pray. Whoever prayed in front of this picture received graces and did not become ill or die. Those who were already ill or dying recuperated. 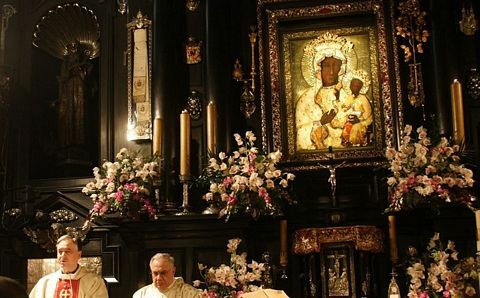 The sanctuary in Poland that houses the miraculous healing image. A special Episcopal committee of the Roman Catholic Church investigated these claims and by 1939 had documented around 3,000 recorded acts of grace, including many miraculous recoveries and cures. 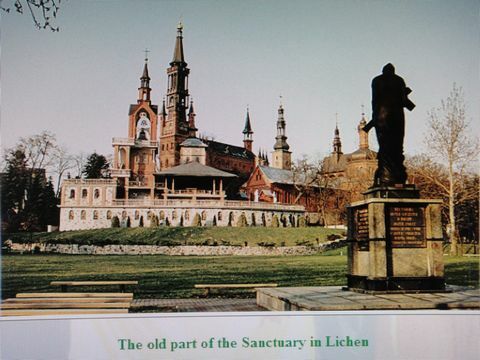 The old part of the sanctuary in Lichen, Poland. The miraculous painting survived many incidents over the years. 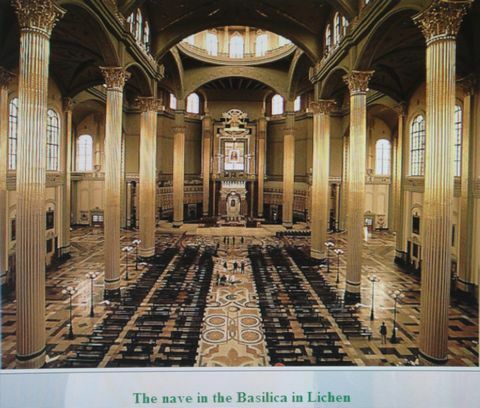 Thanks to the generosity of visiting pilgrims, a new Sanctuary of Our Lady of Lichen was built, modeled after St. Peter’s Basilica at the Vatican. 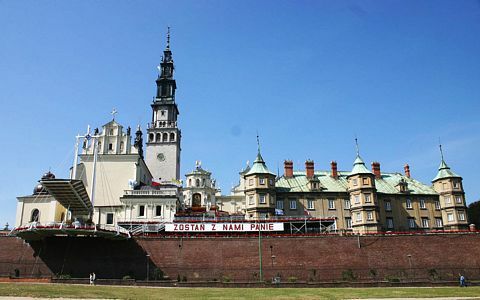 Pope John Paul II consecrated this church – Poland’s largest – on June 7, 1999. It is the 7th largest church in Europe.